Froggy Price Negotiator is based on an innovative idea in the world of e-commerce. Indeed, this module will offer your clients to negotiate the price of your products and thus increase your conversion rate. 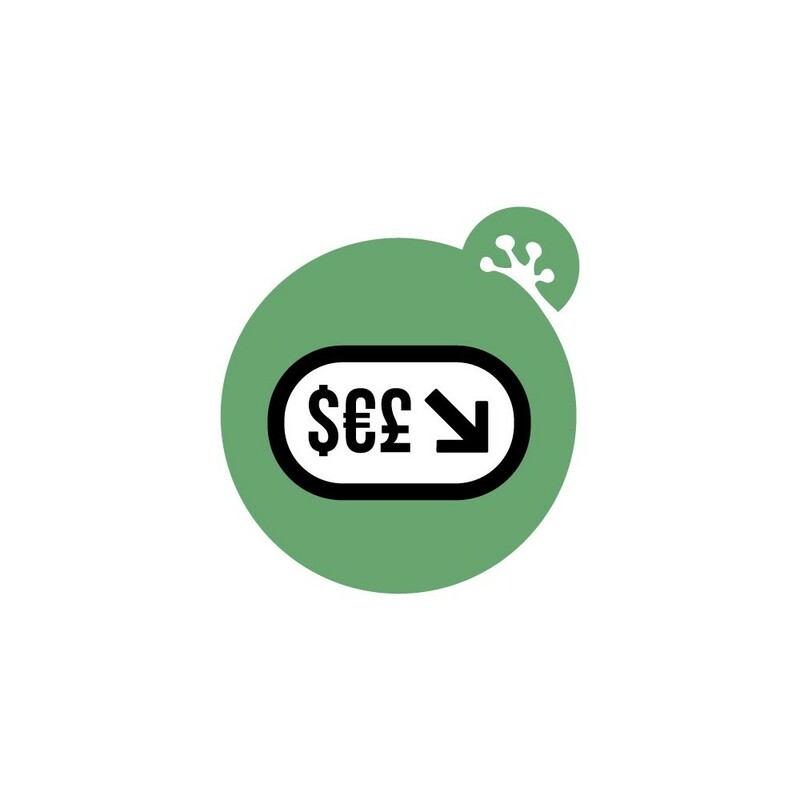 Fully configurable, the module will allow, for each one of your products, to set a minimum sell price in order to define the bargaining. You can also refine these prices on products combinations or simply define a negotiation in percentage for all your products. Furthermore, you are free to specify the behavior on promotional products but also the number of negotiables products per customer. You can exclude certain brands, product categories or groups of customers. Therefore do not hesitate to adopt this innovative concept that will be an additional selling argument against competitors! During the consultation of a product page on your shop, the button will appear after a certain time (configurable) in order to create surprise and amazement to your customers. 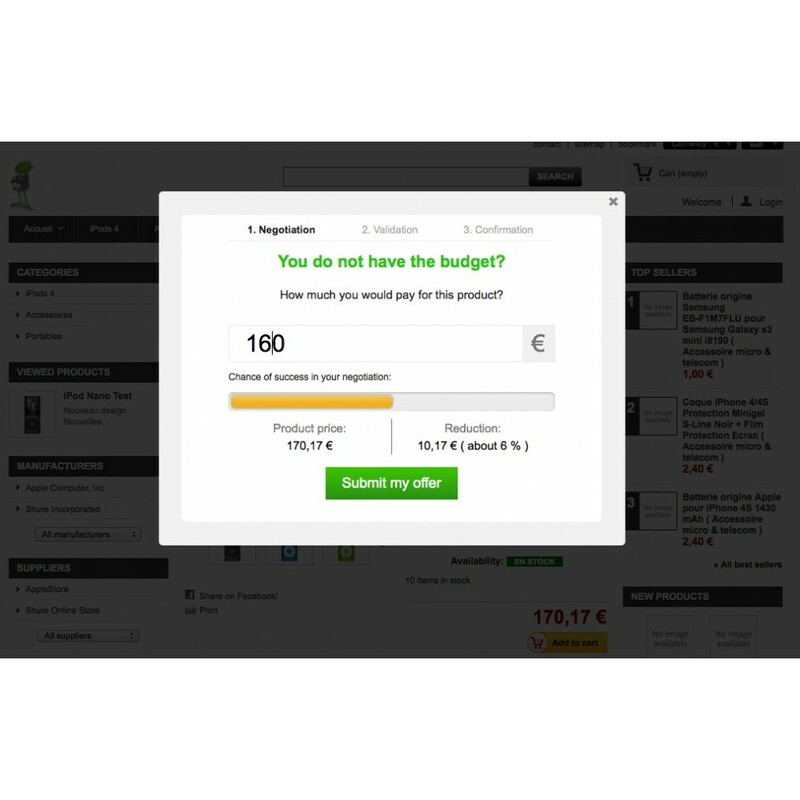 Once clicked, a window will offer to the buyer to enter the price at which he wishes to purchase the product. An indicator will show him the likelihood of success of its bid. The negotiated price will never in any case, be lower than the price specified in the module configuration or product configuration. Once the negotiation establishes, the customer must enter its e-mail address in order to receive the exclusive offer. 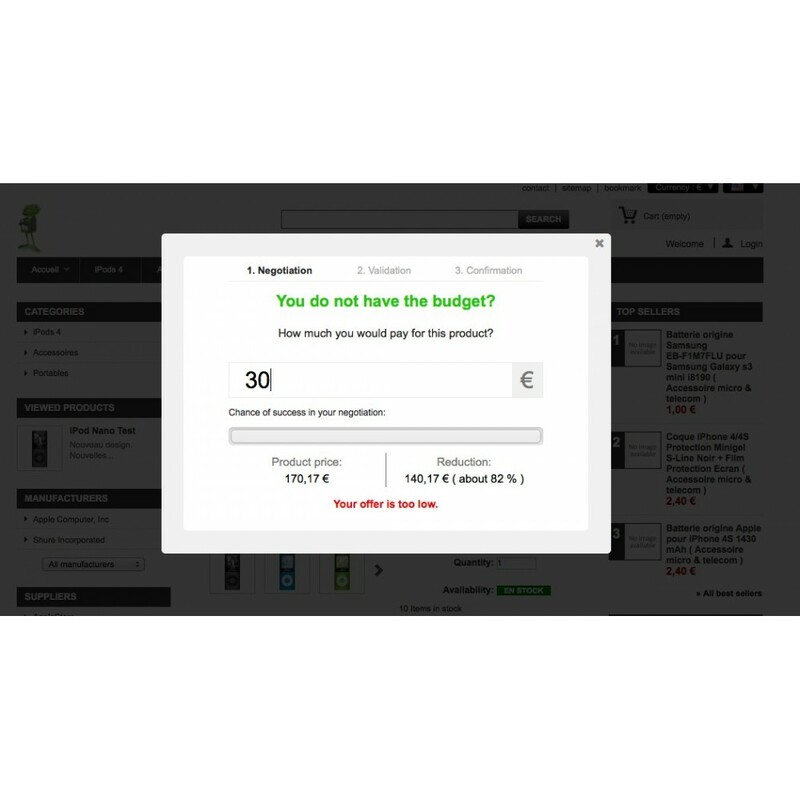 This will have the effect of generating a voucher valid for 24 hours and add it to your cart with the product. Finally, the module will fit in your shop thanks to its appearance configurations that will allow you to customize the shape, the color of the button but also the appearance of the negotiation window.